One thing I observed in his hand that his little (pinky) fingure is crooked (bent). That is the first time I have seen a middle finger bent, leaning towards the index finger. Thanks for posting Pranab Mukkherjee's palm prints. Though I don't like to comment on public pictures because those can mislead you quite easily. But here I decided to write particularly about little finger's first phalange's inclination. His little finger is neither ‘crooked’ nor ‘bent’ at all. It is only the first (nailed phalange) is somewhat inclined to other finger. It is a very strong and positive sign indeed, like a person is set out to win every event anyways. It shows his special way of doing something. It increases the Mercurinian qualities in a person. I believe a curve in the upper part of the little finger shows the shrewdness. This may incline a person to engage in lobbying against the rivals and that is what he has been doing. He has control on his speaking, a statesman; this is a valuable gift for him.This inclination shows cleverness, eloquence, powerful use of language. Crooked is something else. It has a definite curve in the entire finger. It can be of various degrees. That may reveal outright chicanery. That can make a person who is without scruples or principles. However, when the fourth finger is found ‘low-set’ as in this case too, denotes the circumstances were against the person and that his life will be a struggle, earlier abandonment. Did you know once Congress rejected him and cancelled his even primary membership? The space between the third (ring finger) and fourth (Little finger) fingers shows the degree of love for self-reliance and love for independent acts. Original thinker. In political field he is considered a problem solver. Success line is giving him sufficient capabilities and confidence to be a person what he is now the first citizen of a great democratic country whose population is more than 120 crores. For me little finger is not little, its value is immense. Enjoy! I would like to indicate that upper phalange of little finger is bent (curved) not full finger but I did not mention clearly. In the same case like I found in various palmistry books that "Pandit Nehru" first Indian prime minister little finger upper part was curved toward Apollo. 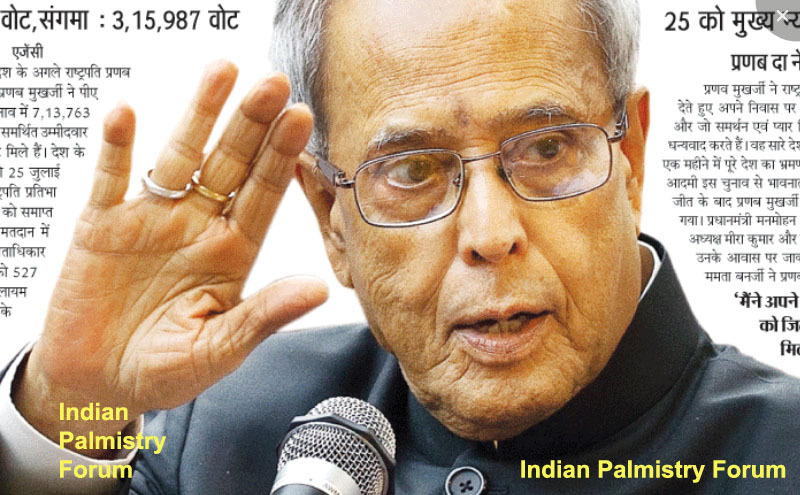 Pranab does seem to have a very full top phalange on his little finger, occasionally linked to cardiovascular problems, but an outstanding one- for me it leans and is placed outwards, often a sign of someone who is very individualistic in not being frightened to act outside the square and certainly a capacity to sell his message to the public- his sense of responsibility strongly guides his leadership style as the middle and index fingers are often together, as opposed to the little finger. He head line- mother line - seems quite open and independent in thinking and actions and a strong will. He has an outstanding line of Apollo so others recognise his talents and his Apollo finger heightens his statesmanlike skills in diplomacy, he seems to have a strong creative focus and may also have a strong spiritual approach- I wonder about the strong line of attachment with what appears to be a mole on the end? 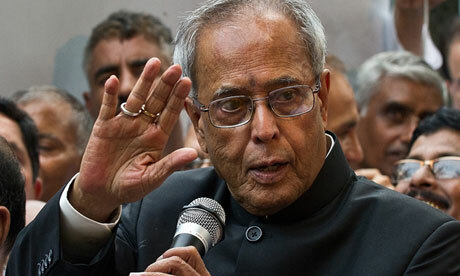 Pranab's pinky finger seems little bit smaller in length. In most of the palmistry book its memtioned thet normally the tip of little of pinky finger should reach upto the lower border of first phalange and I dont think it meets this criteria. Its true it is low set. Though little finger is stronger and seems with full energy the small sized little finger is often interpreted as introverted and shy person. Little finger is the finger of communication and speech and smaller means some lacking.These things seem to be contradictory for a leader of this much political height . So I become confused when I get the ironical things on palm and personality. 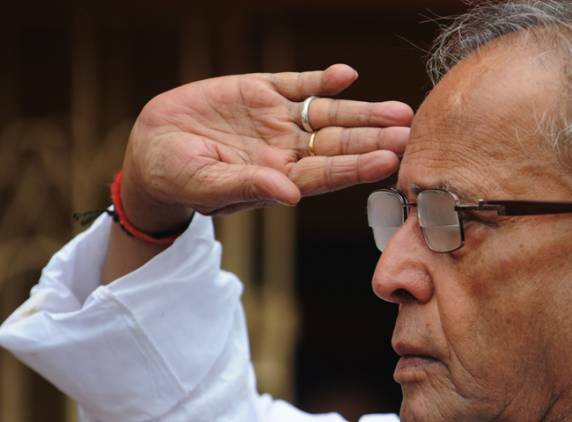 One more remarkable thing about pranab's pinky finger is its pointed tip. Though as Asif said the upper phalange is bent the finger tip is pointed. Pointed tip signifies a person with heightened intution and a person who has well developed sixth sense. Pointed tip of little finger is also found in many sages and spritual gurus.